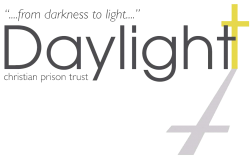 Daylight works with prisoners and ex-offenders across the UK. Here are some of their stories. Names have been changed to protect individual identities. Stephen was a prisoner who had been sentenced for drug possession and dealing in heroin. He faced a four year sentence and thought that life had lost all hope. It was during his time in prison that he first heard about Jesus Christ. In realising the wonderful news that was presented to him, Stephen became a Christian and saw his life transformed as he tackled his drug addiction and its social, physical and psychological effects. After being released from prison, Stephen wanted to share with other prisoners the great news of His saviour Jesus. He is now working for Christianity Explored and Daylight to tell offenders how they too can see their lives transformed. “I want to take this opportunity to thank the good Lord for His amazing grace and providence in mercifully using Daylight Christian Prison Trust to help me during a very excruciating and unprecedented time in my life. God was willing, even under circumstances of a heinous conviction, leading to a 20 month prison sentence which I unquestionably earned, to reveal His unfailing love toward a horribly backslidden Christian. I have no recollection of the actual event that lead to my sentence, as I was completely intoxicated as a result of an alcoholic binge. However, I certainly recall the events, as I sobered, that lead to my inevitable incarceration. To grant a greater understanding of the Lord’s compassion, and without being too graphic, I feel it important that you are aware of the crime I committed. On the afternoon in question, I was drinking very heavily, whilst my identical twin brother, whom I love incredibly deeply, was staying at my home. In my drunkenness I was beset with a propensity for violence, and proceeded to assault my loving brother, with whom I have always had a very close relationship with throughout my life, armed with a broken glass. The result meant that my brother lost an eye. As I write this emotion is already running high and tears are rolling down my face. Leading up to this event I was supposed to be, and had been, and ambassador for God, but instead I was a lost and utterly broken individual, having recently lost my infant son due to organ failure. My faith was in tatters. I blamed God for a time, and turned to alcohol as a painkiller. This also lead to the breakdown of my precious marriage. The agony that my family and I endured over this tragic accident is indescribable. It was my first time in prison and the overwhelming feeling was a mixture of deep remorse, regret and shame. Not a day went by, in the initial months, when I didn’t weep. I was placed, by prison officials, under constant suicide watch. I cried out to God for his mercy and help, praying fervently for my brother’s total recovery and knowing that I was completely in the dust. The complete forgiveness of my brother form the outset just intensified the pain. By God’s grace I was appointed a Christian counsellor via the chaplaincy, a weekly undertaking that lasted nine months. God enable me to accept my Christian brother’s forgiveness. As my sentence furthered I drew very close to the Lord, and to this day, I have never known His presence so profound; as real to me as my own hands and feet. The Lord, unfathomably skilled in turning dire situations around for good and His glory, has been a greater revelation than I ever imagined. Although during my sentence I had no access to any material regarding the ministry and work of Daylight, my wife heard, on the Christian radio station UCB UK, about this prison ministry, and making a note of their telephone number, immediately called them for support. She was met with warm and understanding support, and a regular meeting with Daylight volunteers was established. This afforded my wife a wealth of care; even though we were in constant contact, my wife longed for support on the outside. She assured me that as a consequence of Daylight’s involvement that indeed there were many people who were in earnest prayer for us. I’m very grateful to those from Daylight who met with my wife on a very regular basis; it was an immense help to her during such a confusing and bleak time in her life. During discussions with those key people from Daylight, it was arranged that I would be collected, upon my release, by their Chief Executive, Dr John Scott. Once discharged, having completed my sentence, and walking through the main gates of the prison, there standing next to his car was John. I felt overwhelmed and extremely humbled. John negotiated the very long journey from Holme House Prison in the north east of England, to Somerset, where I had arranged for temporary accommodation. After four weeks of residency within the temporary accommodation, and by God’s incredible grace, being honest about where I had just come from, I secured a managerial job for a national company. The accommodation, although basic was expensive and my salary could not cover the entire rental costs of remaining there. Notwithstanding, I had nowhere else to go. Daylight made financial provision, making a substantial payment towards the half-way house to safeguard my residency. Again I was immensely humbled and grateful. In time I secured my own accommodation as a private resident where my wife joined me, which we made our home for the next year. My wife then became pregnant and we decided that it would be prudent to relocate to an area closer to family and close Christian friends where we could receive generous support that we needed. Again, by God’s goodness, I procured another managerial job in Berkshire, close to our family and friends. However, I had to start work in this new business quite quickly and time was not on our side. Although family and friends lived in the next county it was still too far to travel considering the proximity of the workplace. Daylight, through John Scott’s personal links in the ministry, arranged for me to reside at a Christian couple’s home, close to my new place of work. Mr gratitude towards how the Lord worked through Daylight’s willing volunteers, and especially Dr John Scott, enabled life’s dots to join, even when it appeared to be impossible at times. How wonderful that we do indeed serve a Mighty God for Whom nothing is too difficult! Today I have a close family and God’s reconciliation has had a huge ripple effect throughout the wider family. My wife and I are expecting another child in two months time. I have a good job with a global company, for which I give entire credit to the Lord. “In a world as confusing, daunting and lonely as mine was at that time, I was desperate to understand the situation I had found myself in. I had been in prison for just over four months; initially in local prisons relatively close to family and loved ones whilst attending court but then further afield in a training prison a couple of counties away. The journey there was as uncomfortable as any in a tightly confined space, sliding around on a plastic moulded seat trying to block out the taunts of my fellow travellers in the prison transport van. Flowers in pots outside the reception block did little to lift my spirits. Having dragged my plastic bag of belongings (toiletries, trainers, paperwork, and precious letters and photographs from home) to my wing, I was the new guy yet again. New staff, new procedures, new prisoners, even a new food ordering system to confuse me. The only constant was my quiet, tentative prayer: ‘Please help me get through this Lord.’ I was scared, not knowing whether I would be able to endure this experience, whether my faith would be strong enough to survive this place, whether I was abandoning myself to the onslaught of doubts and fears. I continued to learn, as I had done for months, how to give my fear to God – or at least how to acknowledge that he was with me when I was feeling scared. That felt an important first step during a steep learning curve of a weekend. I struggle now to recall that first Sunday service, although I do remember feeling welcomed. the chapel was much better attended than in my previous prisons and I was impressed by the range of activities mid-week for Christians. On that following Tuesday I attended the evening Bible study, led by Phil. I had assumed that he was a member of the chaplaincy staff; it was a few months before I learned he was a Daylight volunteer. 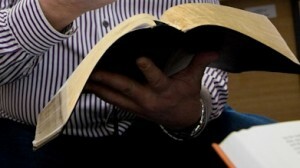 that hour or so of fellowship and hearing from God’s word was a profoundly comforting experience for me. I was welcomed into a community of men who were passionate about God, his purposes in our lives and living for his glory. Phil taught with enthusiasm and clarity, clearly concerned not only for the guys surrounding him but for his faithful exposition of scripture. I was delighted to see him not shy away from the gospel in all its challenging and multi-faceted glory and answer questions full of truth and grace. I thanked God for such an amazing providence in providing a context where I could be built up in my faith, share experiences with Christian brothers and be accepted without scrutiny of my recently acquired criminal record. Phil cultivated a culture of mutual concern which fostered our love for one another within the group. His knowledge of the system, borne out of many years at the coal face of prison ministry, allowed him to apply scriptural truth to our daily prison experiences. Speakers in services would often allude to our life inside the walls, but he could speak with the experience and insight which could only come from being there, on the wings, with the guys in all the messy reality of life behind bars. We all respected him immensely for the commitment which underpinned that deep reservoir of pastoral and penal experience. Phil and I became closer as the weeks went by, sharing time together on the wing. Prison news, funny anecdotes, poignant sharing of struggles – all had a place in an extremely welcome friendship. His concern was evident for all the men in the prison, as well as the staff. He was (and presumably still is!) held in very high esteem by the establishment and rightly so. He made such a tangible difference to my days, lifting my spirits, praying with me and being a light in an otherwise occasionally gloomy place. Phil’s colleague John was my second contact with Daylight. He preached in chapel services every 1-2 months throughout my time in the prison. Having become accustomed to what could generously be deemed as a ‘range’ of styles and giftings in the prison’s pulpit, John spoke with authority and clarity which was invigorating to my spirit. Most of his sermons have stayed with me and continue to provoke my thoughts, prayers and worship. One of the first sermons of his I heard discussed sin using the analogy of leprosy. As John unpacked his message, god pointed precisely to the things I needed to hear, deepening my awareness of the numbness to sin I had experienced and the challenge of living in a world which would be unlikely too forgive my failings. John’s sermons were good on Sundays, but I felt that their real efficacy showed itself mid-week, when his challenges would still be ringing in my ears as I faced an awkward situation, a potential conflict or personal crisis. I was spiritually nourished and encouraged in my walk with God. Having reached the end of my time inside (April 2013), I hadn’t expected Daylight to figure much, if at all, in what would come next. However, through asking Chris, another volunteer to come and see me, Daylight has continued to support me in marvellous ways. Chris and I have met up on many occasions, accruing coffee shop loyalty points aplenty. Even if he hadn’t had anything interesting to say or we hadn’t developed a good relationship, just the gesture of his travel to visits me would have been a channel of God’s grace to me. Leaving prison is profoundly daunting for myriad reasons, but having someone who knows me, knows my offences and yet is still prepared to give up so much time to encourage me, draw alongside me through life’s challenges and share muffins with is a faithful witness to Christ. I have appreciated our chats, especially as they have enabled me to think through many challenges which have come up whilst on licence. My wife’s severe mental health problems, my struggle to find a church which would welcome me, my own coming to terms with my offending and what the future holds: all these aspects of my life have received a welcome perspective from a mature Christian man who knows me and cares. That level of support and concern is inestimable in value and a humbling reality.